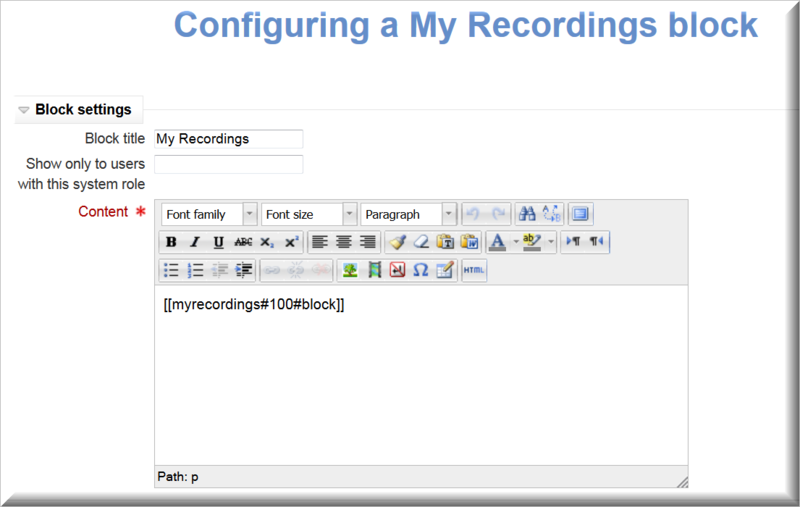 The My Recordings block is used within a course and displays the recordings associated with the course that the students have the rights to view. This feature works on its own as well as with the Moodle basic groups and grouping functionality. When specifying the number of days, remember that this is the number of days backwards from today's date to when the recording was made. If this course will be available for students for several weeks or months, be sure to specify a longer period of time backwards or update the time at regular intervals. 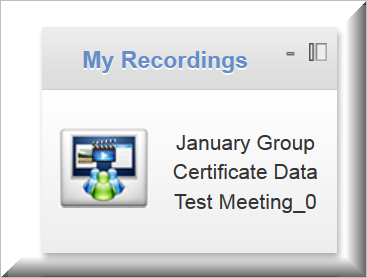 When a meeting has been held and the meeting recording is available, the link to it will appear in the My Recordings block. Before a meeting has a recording, nothing will appear in the block. RT NOTE: The query used to populate the tag is only valid in the course, and will not yield any results on the front page where it comes up as blank. Next, create the Groups and Groupings, which organizes students so as to restrict the content they view. Student must be in a Group in order to be in a Grouping. Within the course, go to Settings >>>> Users >>>> Groups. On the Groups screen, click on Create group. Give the Group a name and save changes. Ensure the Group name is highlighted on the left and click on Add/remove users. Click on users’ names and on the Add button. You can use Shift or Control plus click to add several users at one time. Click on Back to groups. Repeat as needed to create all desired groups. Now, click on the Groupings tab at the top of the page then click Create groupings. Give the Grouping a name. The name used for the Grouping can be the same as the name of a Group, especially if there will be only one Group per Grouping. Once complete, save changes. On the Groupings page, click on the people icon that represents Groups, to the right of the Grouping name. Click on one or more Groups to add to the Grouping. Click on Back to groupings. You can add more Groups to the Grouping or students to the Groups at a later time. 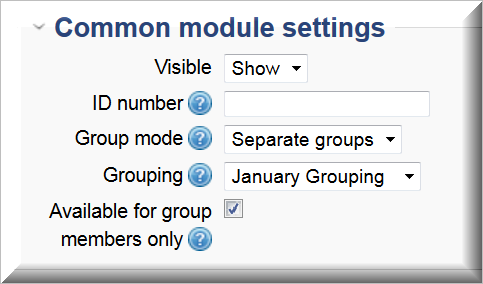 Select Show for Visible and for Group mode select Separate groups and the name of the Grouping (in the example above, January Grouping only). Check off Available for group members only and click on Save and return to course. The users will see only the Meetings that have been assigned to their Grouping.